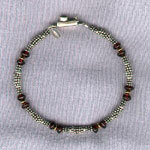 Sterling and garnet bracelet with gold accents and garnet box clasp. 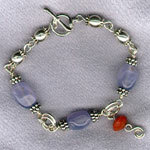 Chunky blue chalcedony link bracelet with faceted topaz dangle. 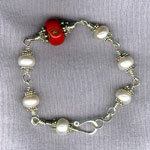 Chunky single coral bead surrounded by 9mm freshwater pearls and sterling heishi, wired together with a custom hook clasp. 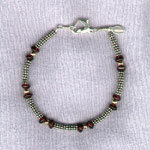 Sterling and garnet bracelet with gold accents and heart-shaped lobster clasp.